High Efficiency Video Coding (HEVC), also known as H.265, is a video compression standard, one of several potential successors to the widely used AVC (H.264 or MPEG-4 Part 10). In comparison to AVC, HEVC offers about double the data compression ratio at the same level of video quality, or substantially improved video quality at the same bit rate. It supports resolutions up to 8192×4320, including 8K UHD. Also know as H.265, HEVC is the latest video compression standard that is said to double the data compression ratio compared to H.264/AVC at the same level of video quality. Video encoded with HEVC will maintain the high visual quality, but at a smaller file size. An HD video is usually very large in size, in order to save space while remain the video quality, converting the HD video to an H.265 video is the perfect solution. Result is the image quality is the same, but the file size is reduced to half. Sometimes H.265 videos are not played by the devices or edited in NLEs. So in order to make full use of the H.265 videos, you can also convert them to more formats like MP4, MKV, AVI etc. So if you wanna convert your video files(H.265) to or from H.265 to get the quality with smaller size but have no idea how to begin, this tutorial should help you. Just read further to learn what things you can do to convert your video files into HEVC format or convert your H.265 videos to any formats you need. 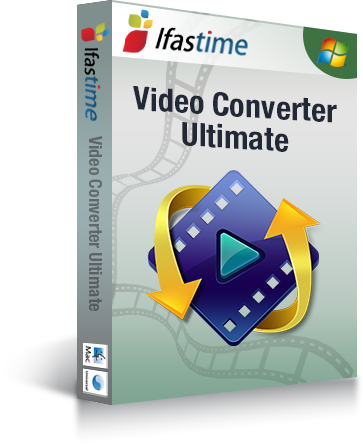 iFastime Video Converter Ultimate is a powerful H.265 encoder, decoder and converter. It can help you deal with the above issues perfectly. DVD Ripper and Blu-ray Ripper can rip and convert DVD/Blu-ray movies to H.265 videos; Video Converter can convert non-H.265 videos to H.265 videos, and convert H.265 to MP4/MKV/AVI etc. It's easy to use, and performs professionally. Convert H.265 to H.264 MP4, AVI, MKV, MKV, MOV, MPEG, M3U8, and more. Convert H.265 to HD media player, Tablets, Smartphones, Game consoles(PS3/PS4/Xbox), 4K TV, 3D TV, Smart TV, Projectors, NLEs etc. Basic H.265 video editing functions: split, merge, trim, crop, add watermark, adjust video effect, edit audio and insert subtitles. Batch conversion and super fast conversion speed with the advanced NVIDIA CUDA technology and AMD Accelerated Parallel Processing (APP). Compatible with Windows (10, 8.1, 8, 7, XP, etc) and Mac OS X 10.11 El Capitan, Mac OS X 10.10 Yosemite, 10.9 Mavericks, 10.8 Mountain Lion, 10.7 Lion, 10.6 Snow Leopard, 10.5 Leopard. Easy-to-use H.265 Video Converter with simple clear interface. Step 1: Download the best HEVC converter and launch the software. Step 2: Click "Add Video" button to load your H.265 video from local media library or download a H.265 video directly with this HEVC converter. Step 3: Go to Format -> Common Video-> H.265, or other videos. Step 4: Tap button "start conversion" to start converting videos to H.265 or converting H.265 to other videos. H. 265 is the new video compression standard after H. 264. Based on the existing video coding standard H. 264, H.265 keeps some of the original technologies, while improves some relevant techniques. H.265 adopts the advanced techniques to improve the bit-stream, promote the coding quality, and better the relationship between time delay and algorithm complexity, to achieve best possible optimizations. To make every reader understand the H.265 and H.264, and make best use of them, I make a detailed comparison. H.265 has better compression performance and lower bandwidth utilization ratio. For video services, the ultimate goal of compressing a movie is to reduce the size of the movie file, so as to take up less storage space, as well as drop the network bandwidth consumption in transmission. Compared with H. 264, the greatest strength of H. 265 is that it has a higher compression ratio, which can be discerned from its name. H.265 is also called HEVC (High Efficiency Video Coding), and the primary use is to further reduce the design flow rate, in order to lower the cost of storage and transmission. At the same quality of coding, H. 265 can save around 50% of the bit rate, and coding efficiency can be doubled than H. 264. As H.265 provides more different tools to reduce the bit rate. For example, in H. 264, each macroblock is fixed to the size of 16 x16 pixels, but the coding unit of H.265 can be chosen from a minimum of 8 x 8 to the maximum of 64 x 64. 0n the left hand side as the illustration shows above is using traditional H.264 standard, and each macro block is fixed; In H. 264 coding technology, the giant sections of data is completely independent to each other, so coding distortion situations are likely to happen in border areas of the giant block. It is H. 265 standard on the right, the size of code unit is determined by the regional information. From the image contrast, we can see the picture quality enhancement and the more delicate character’s skin under H. 265 are much better than H. 264. How do I connect my iPad, iPhone to a TV?